For those of you who did not attend the council meeting or read the Commerce Journal article then let me inform you on the latest twist at City Hall. So what's going on? 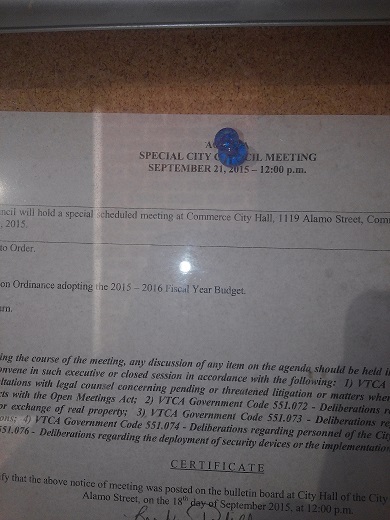 The council failed to pass the 2015-16 City Budget. There were only 4 members in attendance and two voted for approving the budget and two voted against. That's not the questionable behavior. What's questionable is the time of the next meeting. During the discussion following the vote, several different times were suggested to hold a meeting to vote on the budget. It was suggested to meet on Saturday but Council Member Hill could not attend, so that time was ruled out. It was suggested that since there was already a called special meeting Monday at 5, that the budget could be added to that meeting. The Mayor said he could not make a meeting at 5. 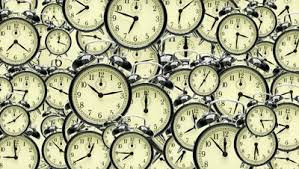 It was then suggested that the meeting start at 4, but council member Martin could not make it because of her job, so that time was ruled out. So when is the meeting going to be? At 39:21 in the video the Mayor said and thus it became part of the official record of the City that the meeting to act upon the budget would be at 5 o'clock on Monday. 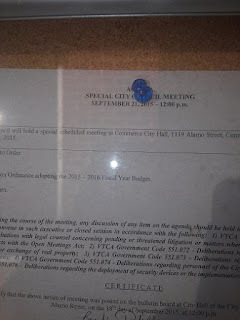 When the Commerce Journal came out on Thursday it was printed: "Due to the failure of the budget to pass at Tuesday’s meeting, a special meeting will be held on Sept. 21 at 5 p.m."
Announce a meeting date and time at the council meeting, have an article in the paper but then post another time? Dig a little deeper. Let's back up and see how the vote came out. Council member Hill and the Mayor voted to approve the budget. Council members Martin and Davis voted against it. So the Mayor and Hill are for the budget and can make a noon meeting, but Council member Martin who voted against the budget ,appears to have a scheduling conflict and most likely will not be able to make the noon meeting. How do you guarantee something you want will pass? Have a meeting when your opponent(s) can't attend. Also keep the citizens confused and uninformed so there will be zero input from them. If you go to the City's website there is no posting of the meeting. Check it out here.